Home Domestic News Premier League Wenger needs to decide soon! It is clear that Arsene Wenger is under immense pressure. With reports surfacing of dressing room unrests to the media constantly asking the same question, and fans marching on the stadium saying No to a new contract, its time you would think for a message from the boardroom in support of their manager to quell any rumours or some other decisive decision that is wanting. “We are fully aware of the attention currently focused on the club and understand the debate. We respect that fans are entitled to their different individual opinions but we will always run this great football club with its best long-term interests at heart. So where does that leave fans and players alike. Reports saying Ozil has refused a new contract points to Arsene leaving in the summer, as Ozil has previously said he would only stay at Arsenal if Wenger remains the manager. The Ox wants out if you believe everything on social media this week, and certainly Sanchez will almost definitely be playing in Spain next season somewhere. 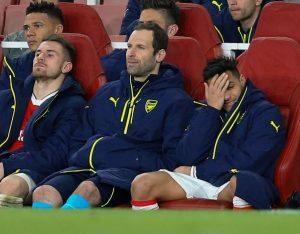 With these issues now mounting, most senior people backing Wenger except his own Chairman, it would seem now is the time to start making decisive decisions to best prepare the team for the next season. The new guy will need time to look at the team, assess what he has got, and make preparations for the summer transfer window. He is also going to be dealing almost certainly with a player exodus, and upset summer training schedule as a result. Dealing with all this at that time isn’t commensurate with the best preparation for the 2018/19 season. Fans are going to want instant results – they have waited long enough. This is the time a decision needs to be made, thats the decision thats best for the club not at the end of the season. Previous articleTyrone Mings gets 5 match ban!